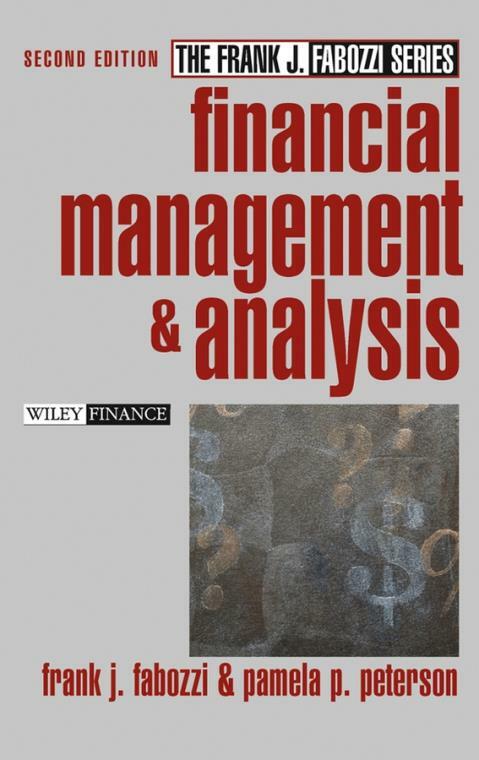 No matter what area of finance you’re interested in financial management, investments, or financial institutions Financial Management and Analysis, Second Edition provides the foundations of finance that will allow you to understand financial decision–making and its role in the decision–making process of the entire firm. Crisp writing and focused content clearly ties theory and practice together in one complete package. Filled with expert advice, real–world examples, and useful charts and graphs, Financial Management and Analysis, Second Edition will help you develop the skill set necessary to deal with the important financial problems you’ll encounter in today’s business world. Chapter 1. Introduction to Financial Management and Analysis. Chapter 2. Securities and Markets. Chapter 3. Financial Institutions and the Cost of Money. Chapter 4. Introduction to Derivatives. Chapter 7. Mathematics of Finance. PART TWO: THE FUNDAMENTALS OF VALUATION. Chapter 8. Principles of Asset Valuation and Investment Returns. Chapter 9. Valuation of Securities and Options. Chapter 10. Risk and Expected Return. Chapter 11. The Cost of Capital. PART THREE: LONG–TERM INVESTMENT DECISIONS. Chapter 12. Capital Budgeting: Cash Flows. Chapter 13. Capital Budgeting Techniques. Chapter 14. Capital Budgeting and Risk. Chapter 15. Intermediate and Long–Term Debt. PART FIVE: MANAGING WORKING CAPITAL. Chapter 19. Management of Cash and Marketable Securities. Chapter 20. Management of Receivables and Inventory. Chapter 21. Management of Short–Term Financing. PART SIX: FINANCIAL STATEMENT ANALYSIS. Chapter 22. Financial Ratio Analysis. Chapter 24. Cash Flow Analysis. PART SEVEN: SELECTED TOPICS IN FINANCIAL MANAGEMENT. Chapter 25. International Financial Management. Chapter 26. Borrowing Via Structured Finance Transactions. Chapter 29. Strategy and Financial Planning. Appendix: Black–Scholes Option Pricing Model.